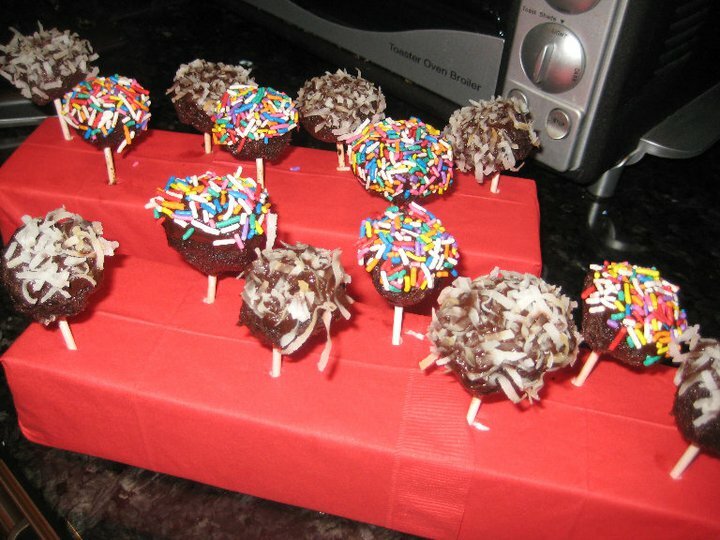 Okay, so you might think that cake lollipops aren’t so unique, but I was always afraid to make these so I figure other people might be as well. If I can do it, you can do it! My sister, Francine, is a pastry chef who I call all the time for cooking and baking advice. She lives across the country and we talk at least once a day…mostly about food! Well, she made the most incredible red velvet cake lollipops and I couldn’t stop eating them. For a diabetic, that is not a good idea! I decided that I would make them myself and see if they would be as good as hers. Could I be a pastry chef? 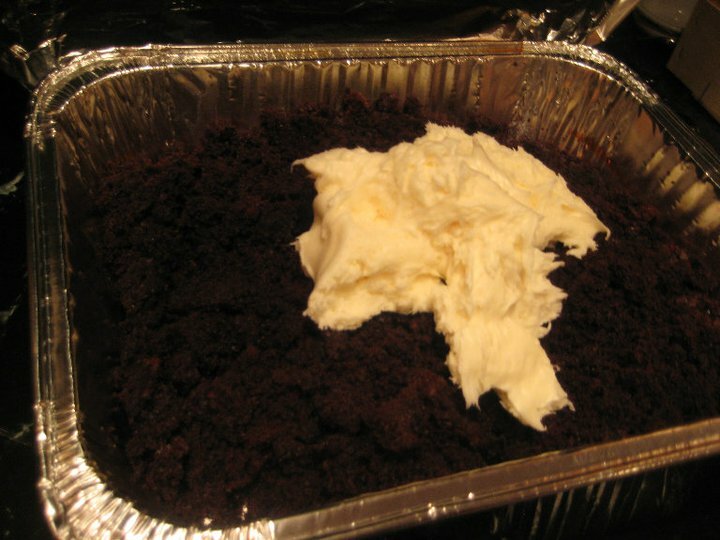 After my son helped me bake the cake (don’t worry, he washed his hands) and it cooled, I added a small container of vanilla frosting and mashed it up. I put gloves on so I wouldn’t have to worry about washing my hands. I don’t need mushy cake under my nails. I then rolled the cake in to little balls and placed them on parchment paper. In to the fridge for 30 minutes to harden up a bit. At this point, you can cover the balls without lollipop sticks. 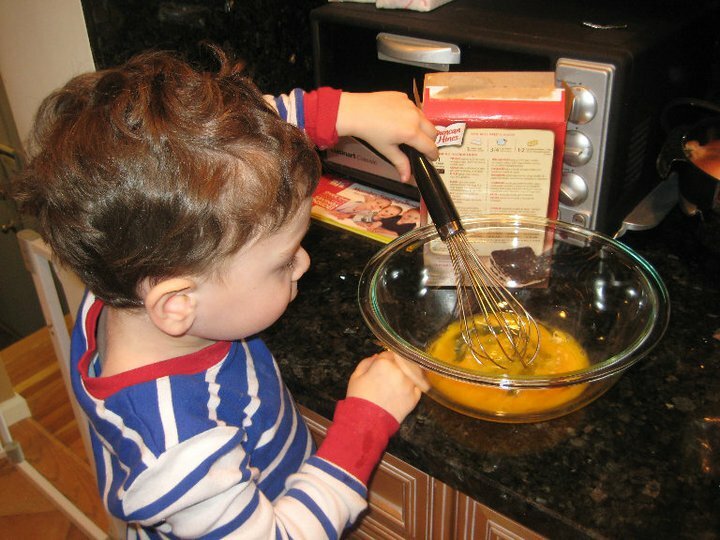 But if you want to make cake pops, there is one more step before chocolate dipping. First, melt some extra chocolate in a bowl. 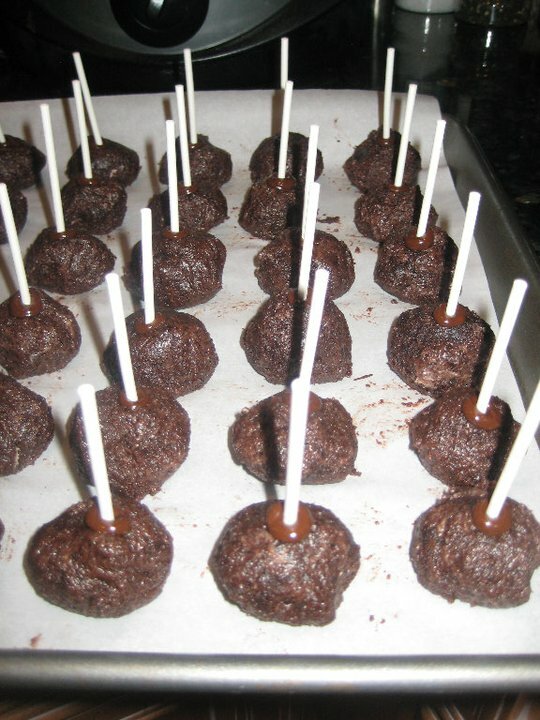 Then dip the tip of a lollipop stick in to the chocolate and then place it in a chocolate cake ball. Repeat for all sticks then place back in the fridge for another 30 minutes so the chocolate on the sticks hardens inside of the cake balls. 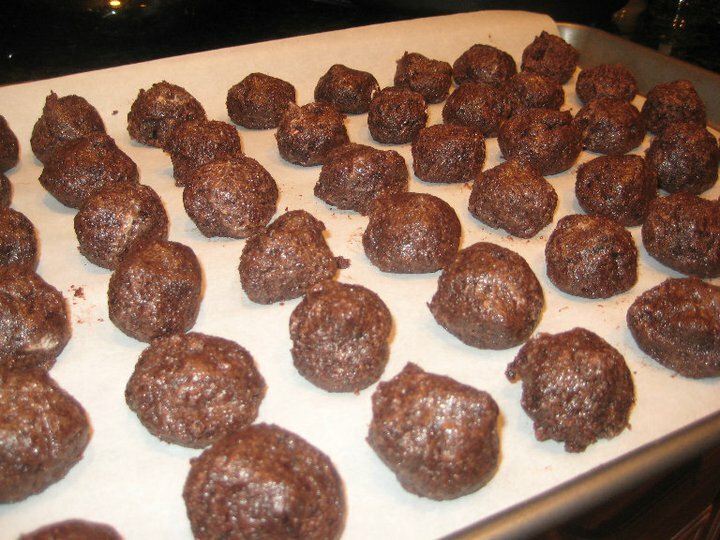 When your 30 minutes are up, the cake balls are ready to dip! 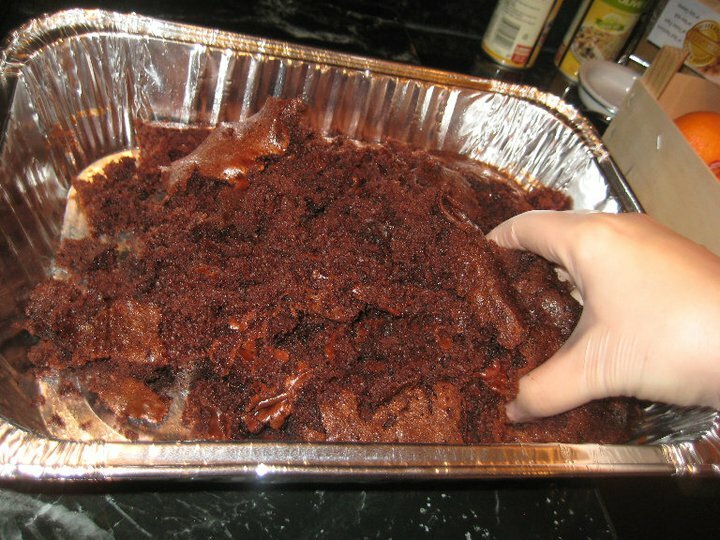 I like to melt the chocolate in a microwave since it is easier that way, but you can use a double boiler if you have one. Just place the chocolate chips in a microwave safe bowl and cook for 30 seconds at a time. Stir and then place back in the microwave for another 30 seconds, for 2 minutes in all or when the chocolate is melted. If you think the chocolate isn’t loose enough for dipping, I got a great tip from Francine: add some pre-whipped whip topping to the chocolate and place in the microwave for another 30 seconds. The consistency will seem strange at first but keep mixing and it should become nice and smooth. NOW you are ready to dip! If you have a piece of foam, you can dip the cake lollipops and place them in the foam so they cool upright, but if you don’t, just place them back on the parchment paper and they will just cool with a flat top. *after you dip the pops in the chocolate, you can also dip them in any toppings you want. I used toasted coconut (which Justin hates) and sprinkles for mine. 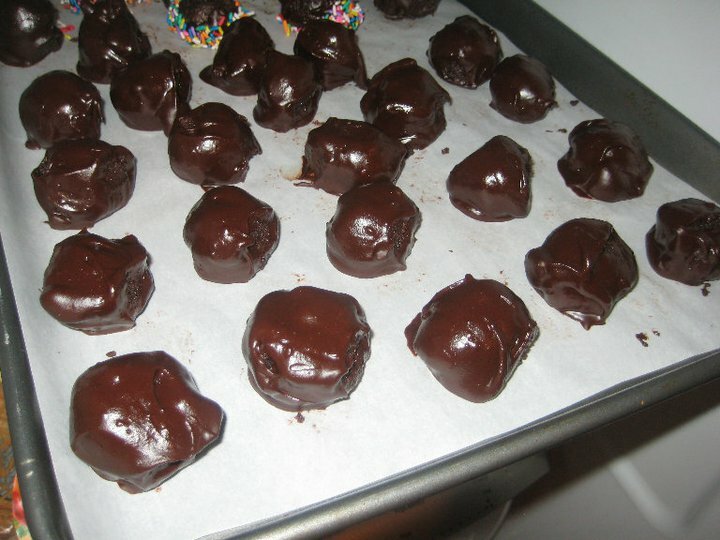 Since I didn’t have enough lollipop sticks, I dipped a whole bunch of the cake balls in the melted chocolate and froze them! They will last forever in the freezer and they taste great when they are really cold. The inside never really freezes so they have a nice soft center, almost like eating a truffle. After I made these, I was inspired to make more. Maybe it’s because Zach had no school AGAIN due to a snow day! Either way, I decided to go in a different direction this time. I didn’t take any photos, but I thought I would tell you about the cake balls since they were amazing! I used a spice cake mix, vanilla frosting and mini chocolate chips for the center, and dipped them in melted white chocolate. So good! They are also in my freezer and I think about them almost every day. They taunt me actually. 3 Comments on "Chocolate Cake Pops"